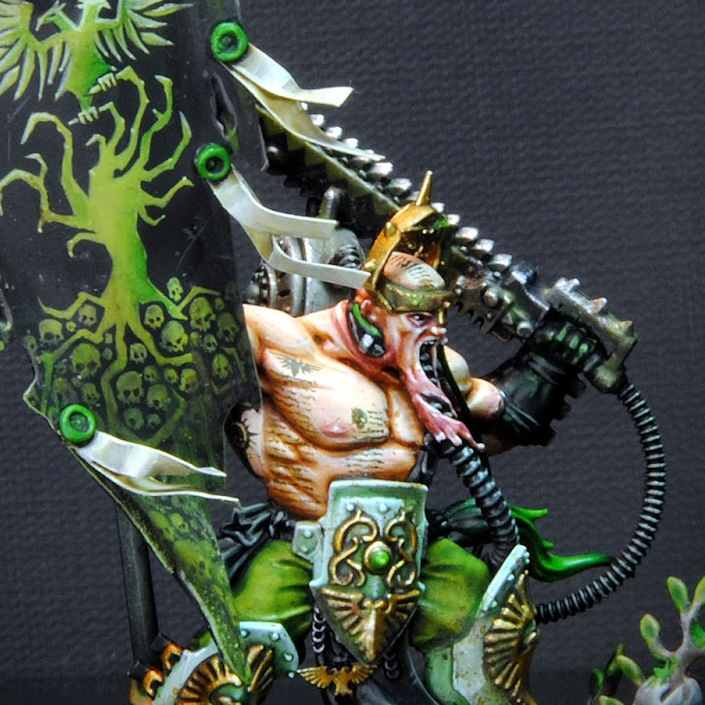 Today we have yet another amazing looking model from Blog de Kouzes' advent calendar. This is part of a series of 40k models that have made that all share this forest theme. This conversion looks like something straight out of some of the crazier 40k illustrations, and I love it. The tube going into the mouth with the bits of flesh hanging around it is perfectly morbid. If I'm correct, I think this uses a Bloodbound hero model with some Custodes bits for the bulk of it, with a bunch of other bits thrown in of course. The pose is great and this truly looks like a fanatical devotee of the Imperial Cult. The paint job is spot on, with crisp highlights and smooth transitions. I really like how much the warm skin contrasts with the green used throughout the model. The green is a brilliant shade as well. It's super vibrant and really makes the model pop. The freehand on the banner is another stand out feature, with the Imperial Eagle looking a little more phoenix like then we're used to. I really like everything about this model and I'm excited to see the whole warband photographed together at the end of all of it. I highly recommend that you check out their website for more views of this model as well as all of the other advent models. Be sure to check out more views of the model on Blog de Kouzes and show the artist some love if you like it.